The skies are clear and sun is shining bright. Today, A and I are on our own, exploring Penang on foot (with an occasional taxi ride here and there). While A is looking forward to exploring some picturesque heritage homes and doing some jewellery shopping, I am on a mission to have the best chicken rice in town. Down the road from our hotel, nestled on the corner of Jalan Penang is Kedai Kopi Kheng Pin. From its marble topped tables to its dark wooden chairs, this old-style kopitiam that has earned a reputation for serving some of the best hawker food in Georgetown. While known for selling delectable deep-fried lor bak, this coffee shop serves what is arguably Penang’s best Hainan Chicken Rice. Hoping to beat the rush, we arrive at Kheng Pin just before lunch only to discover that at this coffee shop, there is no lunch rush. The wave of hungry customers starting from the early morning never stops. Luckily, we don’t have wait long. A table is being cleared not far from chicken rice stall. While A heads for the table, I go for our orders of chicken. Standing by the stall, I’m in awe of the speed – the slicing, the assembly of the plates and quick delivery to the tables. I politely ask the Chicken Rice lady for two plates. Without pause, she asks me where I seated and that I’ll have to wait. “Many orders before you…”, she adds. Seated beside my wife, I wait and wait. Finally, on apple green plates, our orders arrive–glistening white chicken flesh sliced with mechanical precision and laid carefully over a bed of aromatic steamed rice. Accompanied by a orange bowl of warm chicken broth and small side of chili sauce, each slice of chicken is soft and silky yet has enough full-flavored chicken bite to it. But what captures my taste buds is the rice. Boiled in the same broth as the chicken, each grain is rich with flavor. Each starchy spoonful echoes the deep, delicate essence of the chicken. I don’t know if it is the best in Penang. But at that moment, it was best plate I’ve ever had. Still feeling a bit peckish, I decide to order an old favorite of mine, the Char Kway Teow. Over a high flame, flat rice noodles are stir-fried with pork lard and quickly combined with a variety of ingredients: chili, shrimp, cockles, wedges of fish cake, scrambled eggs, bean sprouts, spring onions–all coated in combination of both light and dark soy sauce. While most Char Kway Teows are quite hearty almost to the point of sinking to the bottom of your stomach, this Kheng Pin’s version is almost light and far less lardy than I’ve come to expect. Because of the lack of the greasy feel, the flavors and textures come through with a greater clarity: the pleasing bite of the shrimp, the crunch of the bean sprouts, the pungent heat of the chilies and salty sweet of soy sauces. Bound together in a hot wok, these distinct tastes and textures meld into a simple, delicious dish. It’s our last night in Penang and I am tired. While I am still looking forward to have some Indian Muslim food at Sup Hameed–a row of hawker stands we passed on due to last night’s sudden downpour–I can’t help but feel a bit worn out from all the day’s walking in the humid heat. On the second thought, I decide go. We still need to eat and besides this eatery is not far way. Only open at night, Sup Hameed has made a solid reputation of making…soup. Meats like mutton, goat, beef (and more ‘exotic’ beef parts) are boiled until tender, creating a slightly viscous, hot and spicy soup. Serving their soups with thick slices of Roti Bengali–a rustic, handmade bread, these bowls of ‘sup’ are so popular that they seem to flying out of small, sidewalk stand. Everyone at every table us seems to be eating a bowl or two. Except us. 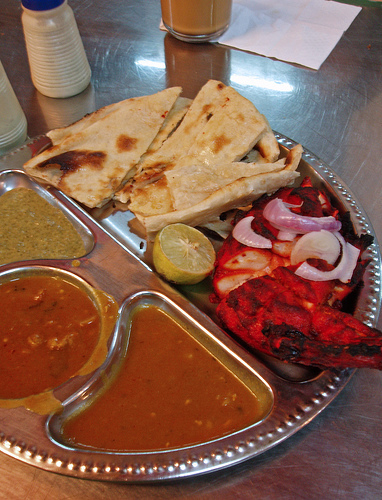 Feeling a bit weary, we decide to fall back on something less strange and unfamiliar, a big steel plate of Chicken Tandoori and side of Buttered Naan. The tandoori and naan were admittedly nothing short of scrumptious. The tandoori was tender and with just enough spicy kick and the naan was warm, toasty on the outside and pillow-soft and buttery on the inside. But I found myself feeling a little bored with the food. Shouldn’t I be trying something different and new? That night, I just couldn’t muster up my adventurous foodie spirit. On the other side of the table, A is voraciously picking at the chicken, cleaning up every last fiber of meat off each and every bone. She loves it. In fact, a week after the trip, she would occasionally closes eyes and say with a longing grin, “Love that tandoori”. Maybe I should have ordered that Beef Tendon Soup. In the end, I didn’t order the soup. So, I guess I will have to chalk up Sup Hameed as the one that got away. I think I’ll add it to my growing list of reasons to return to Penang. The sooner, the better. wow that chicken rice looks delicious! we had chicken rice when we went to singapore which, according to our hosts was one of the best. it was so yummy that i could have finished the whole plate if not for sheer fear of being called a hog! hehehe! The food in Malaysia and Singapore are practically the same. Is one better than another? Gina - Malaysia and Singapore food are practically the same because we used to be one nation until Singapore became independent from Malaysia. That being said, Singapore is a small nation of 4 million people where Malaysia is a much bigger country which spans from the peninsula Malaysia to part of Borneo islands. Food wise, there is no argument that Malaysian food is better than Singaporean food, because of the more authentic tastes and sheer variety of Malay, Chinese, Indian, Mamak (Muslim-Indian) and Nyonya food. 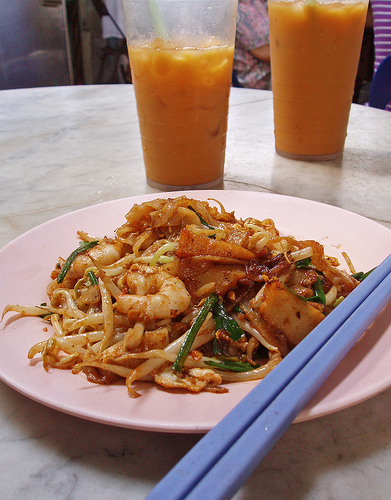 For hawker food or street food, Penang is the best of all in Malaysia. Hope this helps. Hello Mrs. Lavendula. 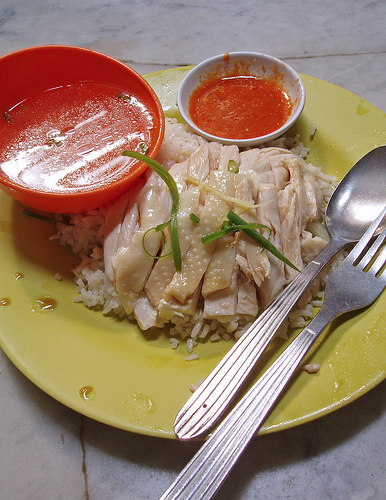 I love chicken rice. But if anything I've learned learned, like Pizza in New York, the best Chicken rice in Singapore or Malaysia is always an on-going, heated debate. Hi Bee Yin. I'm holding you to that deal. Write me when you are back in Penang. Hey Goodfor2. Singapore is great. But if you are just going for the traditional hawker food, I suggest flying to Kuala Lumpur instead. I was told by my friend the Kheng Pin Hainan Chicken rice has new branch at Lorong Selamat - Mid Town Cafe which managed by the Couple's son. I went there and tasted good and also can enjoy the Ice kacang there. Yummy I can enjoy my favourite food - Hainan Chicken rice and ice kacang at 1 time.